UFC 40 poster. This poster measures approximately 24 by 36 inches and was printed on synthetic paper giving it almost plastic feel. This poster has a completely different image and size than the event poster for UFC 40. This poster was posted around the MGM Grand casino(where the event took place),on the days leading up to the fight. UFC 40(Vendetta) was held on November 22, 2002, at the MGM Grand Arena on the Las Vegas Strip, Nevada. There were 6 single fights and 2 titles on the line that night. the welterweight and light heavyweight title. in the welterweight title fight, Matt Hughes beat Gil Castillo to retain the belt. Tito Ortiz beat Ken Shamrock to keep his light heavyweight title. At the time, UFC 40 was zuffa’s biggest show and sold out approximately 13,022 seats. Also in the octagon during the show President Dana White had Tank Abbott as a guest and announced Tanks return with a 3 fight deal. 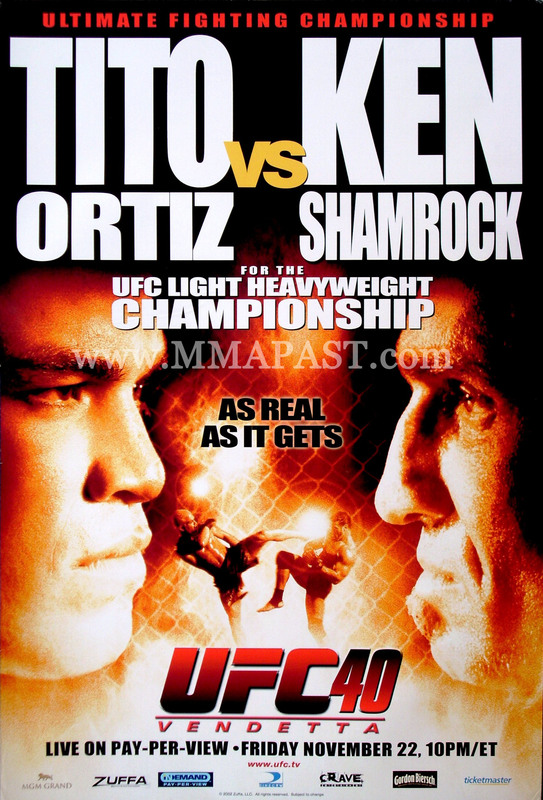 This entry was posted in Ken Shamrock, Tito Ortiz, UFC, UFC 40, UFC posters. Bookmark the permalink.